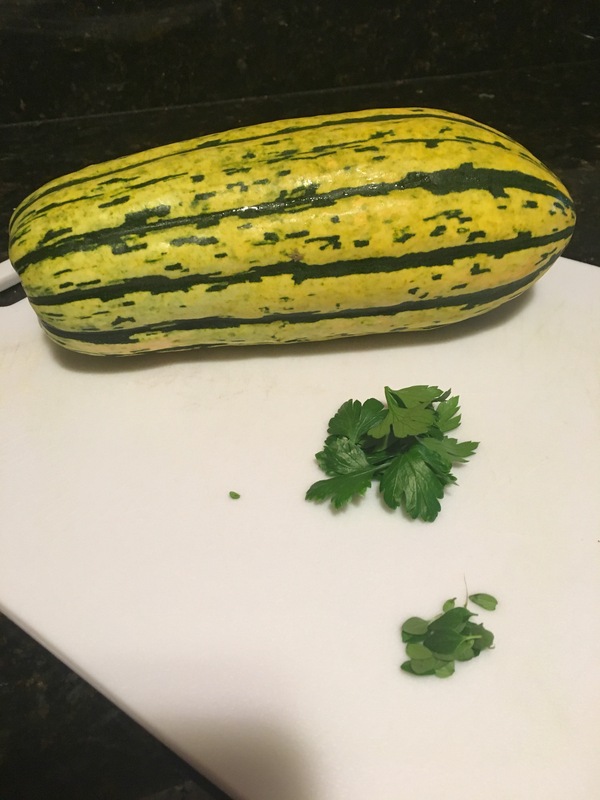 Delicata Squash, have you tried it? 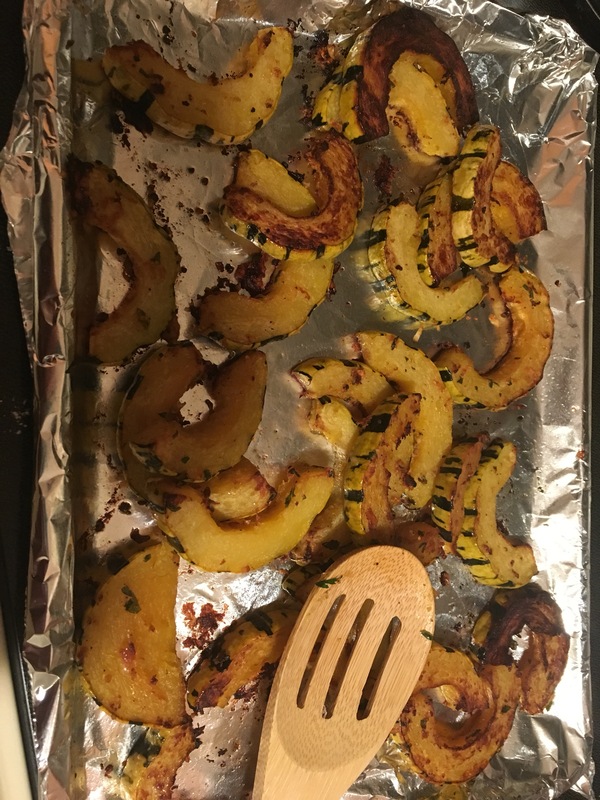 Delicata Squash is one of those things I’ve heard about from fellow foodies, and have always wanted to try, but have never been able to find it and have been way too intimidated to put in the serious effort anyway. But you know me, and i’m all about those vegetables so I finally got over my fears and purchased a delicata Squash from the farmers market. Those are herbs in from of the squash. Delicata is a long squash, kinda yellow-cream with green markings. It notably high in potassium and fiber, and it’s easier than some other winter squashes to prepare because you can eat the skin. Like other squashes, it can be tough to cut without the right knife. 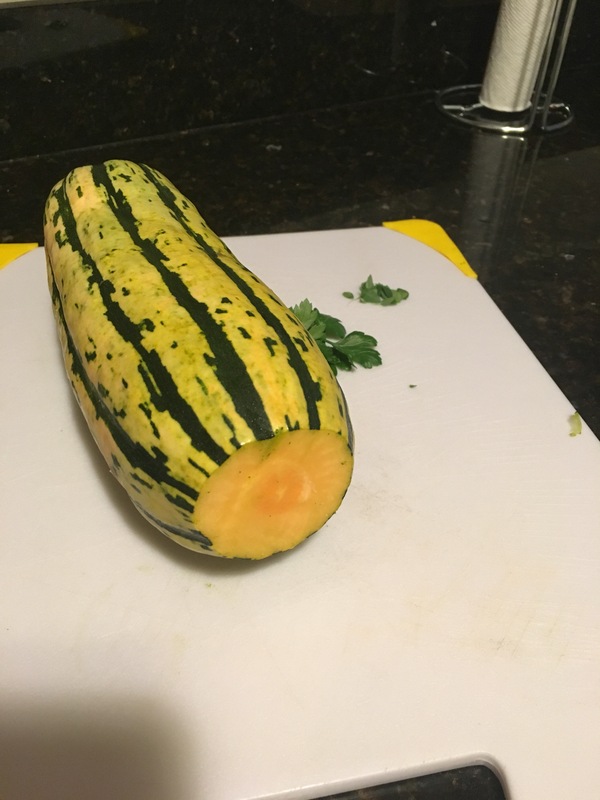 I found the easiest way to cut it is by slicing the bottom so that you can stand the squash straight up, then slicing lengthways. In a bowl, coat slices with olive oil, salt, and pepper. Add 1tsp minced garlic, 2tsp lemon zest, 1/4 cup Parmesan cheese, and 1 TBS fresh thyme and parsley. Coat evenly, then bake at 350 degrees for 25-30 minutes, or until golden brown. There were NO left overs with this meal!! The squash is creamy and tender, and it’s prepared in a way that’s flavorful but not overbearing! Any vegetables out there that YOU want to try but don’t know how to cook? Let me know and we can explore it together! Those are herbs in from of the squash. Delicata Squash is a long Squash, kinda yellow-cream with green markings. It notably high in potassium and fiber, and it’s easier than some other winter squashes to prepare because you can eat the skin. Like other squashes, it can be tough to cut without the right knife. 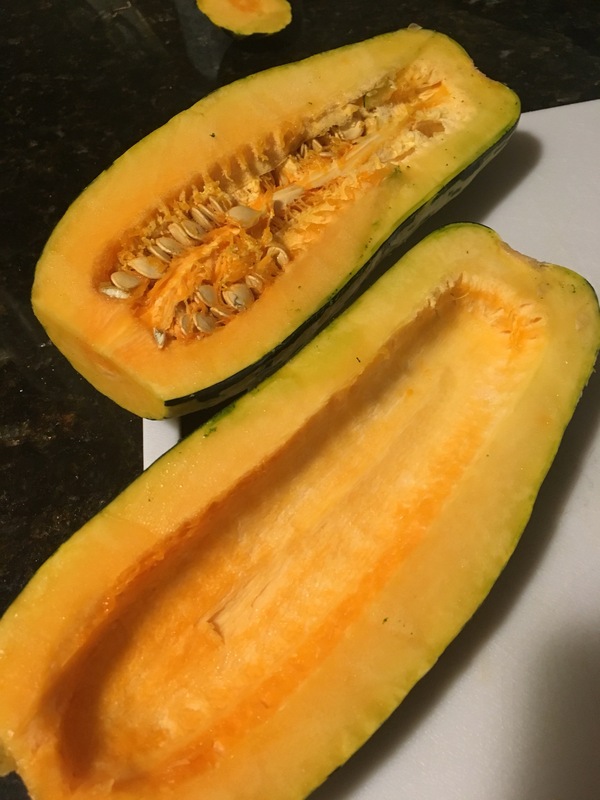 I found the easier way to cut it is by slicing the bottom so that you can stand the squash straight up, then slicing lengthways. I am always looking for new and creative ways to increase the amount of vegetables in my diet. Today’s recipe makes a great side that can replace mashed potatoes for those looking to lower their carbohydrate intake. 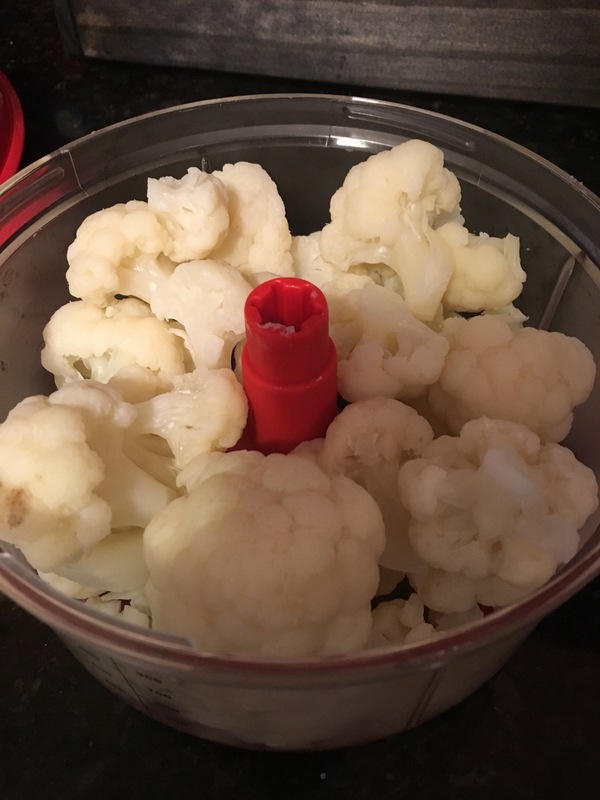 Simply boil the cauliflower until fork tender. For me, this took about 10-12 minutes. Drain the florets, place in a food processor and blend with milk and cheese. THAT’S IT! I apologize for not having a “final” picture, but it looks just like mashed potatoes. We served ours with pork chops, and topped with gravy. The main reason I love making smoothies is because they are so easy to customize to your flavor preferences and health needs. Did you know you can add veggies to your smoothie for added fiber and nutrients? Today I added frozen sweet potato, for a little sweetness and added vitamin A. Another one of my favorites is fresh spinach which packs a punch with iron. 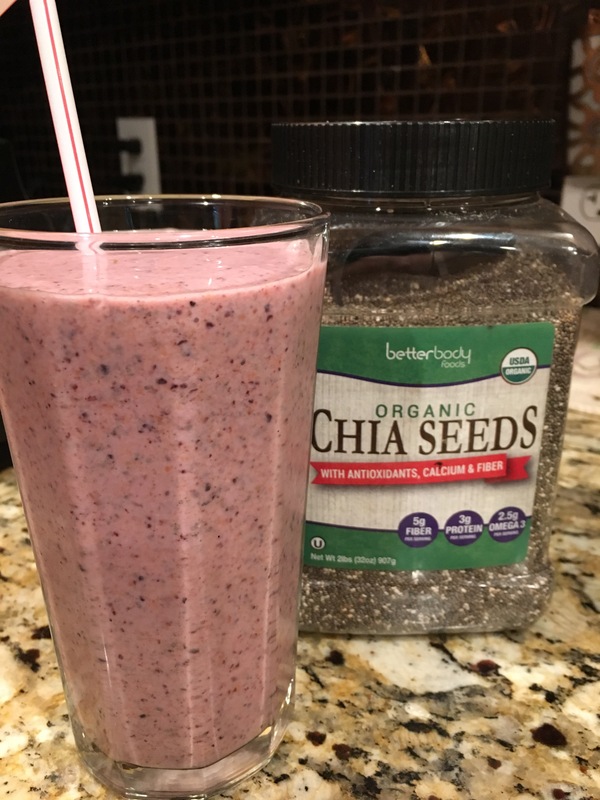 Did you know you can add chia seeds to your smoothie for address protein? A single tablespoon of chia seeds adds 3 grams of protein to your drink, plus 5 grams of fiber! Win-win! Looking for more protein? Try Greek yogurt or peanut butter which are two of my other favorites. Ground flax seeds, similar to chia seeds, also add a dose of protein and fiber to your drink. Stay away from commercial smoothies which are usually pure sugar and juice. When making smoothies at home make sure your drink contains fiber and protein to keep you feeling fuller longer, and prevent ugly blood sugar spikes. Let me know what other foods you add to your smoothie in the comment below! But let me tell you about this salsa chicken I speak of because it’s seriously the easiest thing ever. It’s TWO ingredients. 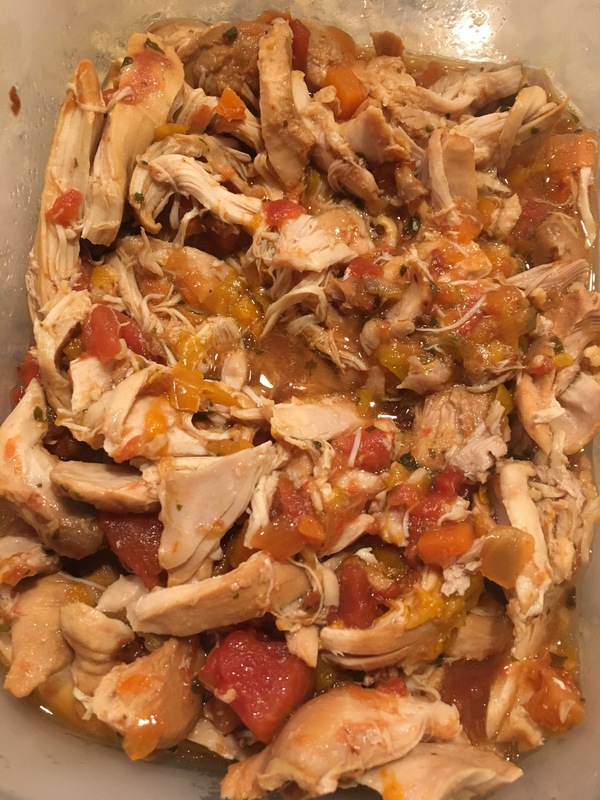 Chicken thighs (skinless and boneless) and canned salsa. Go ahead and clean however much chicken you typically need to feed your family. Place chicken into the slow cooker, dump your favorite jar salad on top and mix around. Any salsa will work here- mild, spicey, sweet, you name it! Cook on low for 6-8 hours. 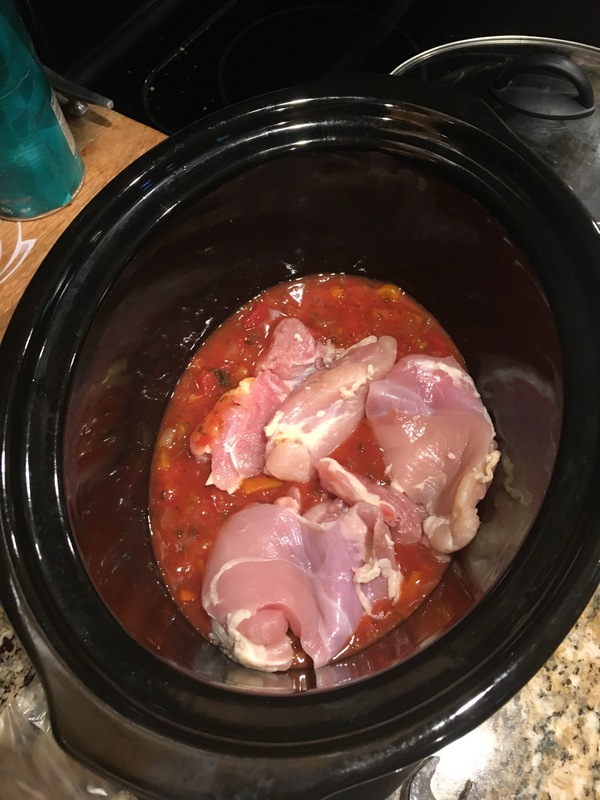 The chicken will shred apart when it’s done and it’s so delicious on tacos! It also worked great on top of a salad or by itself. Make sure to serve with shredded cheese, sour cream, and lettuce. Not only does the salsa gives the chicken moisture, it also gives it a TON of flavor. And it’s so easy! Tonight my family had our chicken tacos on these chia seed taco shells! 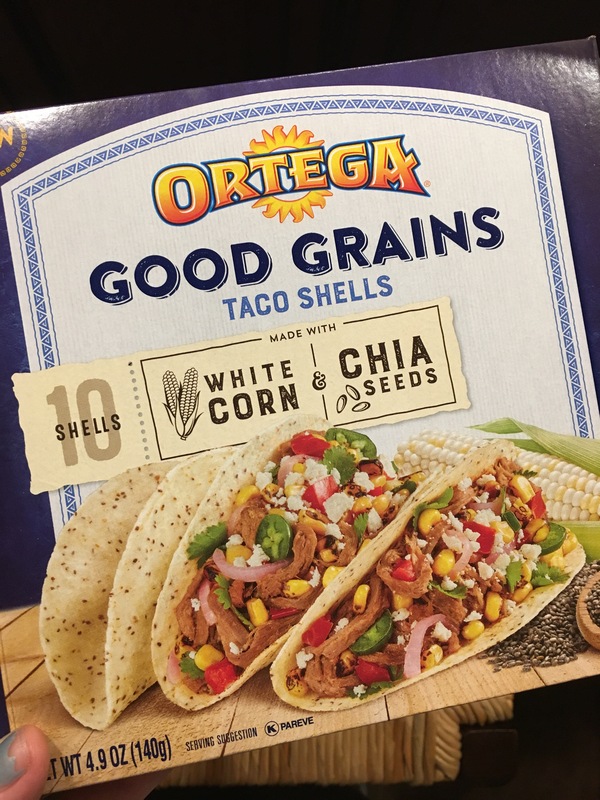 I’ve never tried them before, but I have to say the taco shells were very fresh and crunchy so I would definitely purchase again. 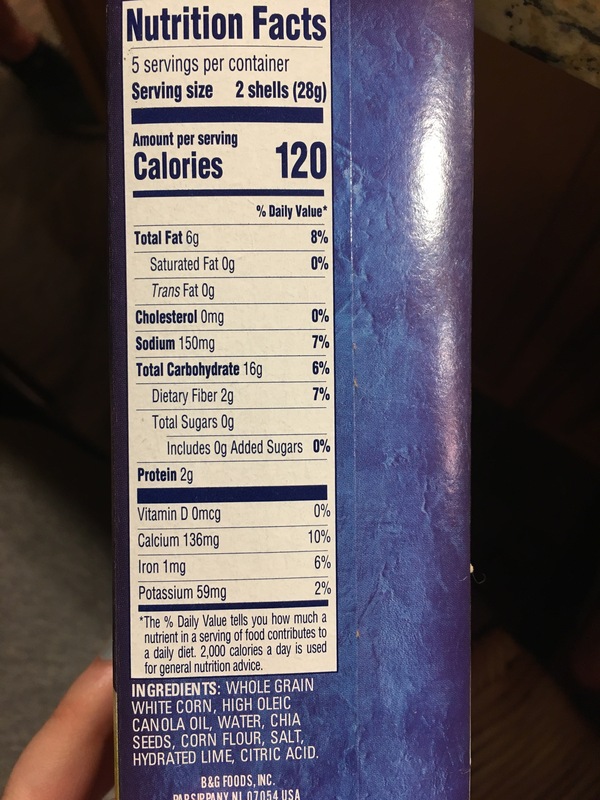 Also including the nutrition info for the shells below. I am not familiar with typical calories and fiber in normal corn tortilla so I cannot comment on how these compare. Make sure to add this recipe to your week night menu. It’s great for families of any size, can be customized to meet your familiy’s spice preference, and most of all only requires 2 ingredients! 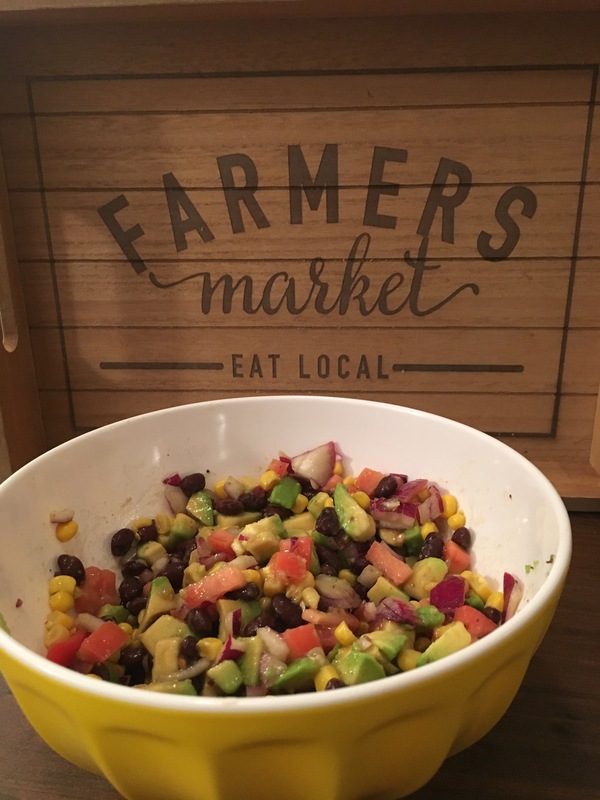 Serve with a quick salad on the side and you’ve got yourself a very healthy meal. Enjoy! One of my personal rules of cooking is to avoid repetitive meals as much as possible. I find that I fall into routine too often, and will end up eating similar meals (say Italian) for several nights in a row. Every once in awhile I like to toss in something new to my mix. 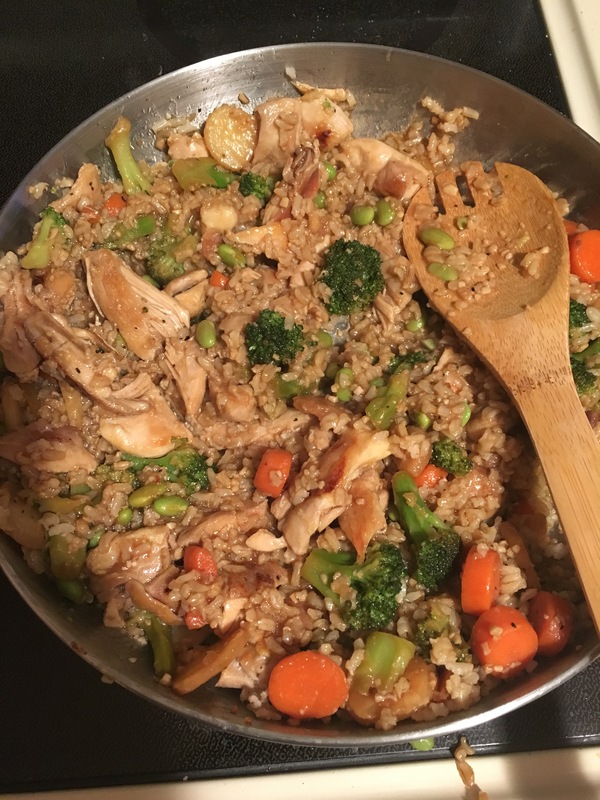 This easy stir-fry definitely did the trick, and brought some new flavors to my plate. I prepared the rice ahead of time, according to package directions. I cooked boneless, skinless chicken thighs on a grill pan, once cooked I chopped into small pieces. In a large pan, add oil and garic and sautée a 60 seconds, then add frozen veggies and cook until tender. Add rice and chicken to veggie mixture. Season with teriyaki sauce and low sodium soy sauce. Enjoy! 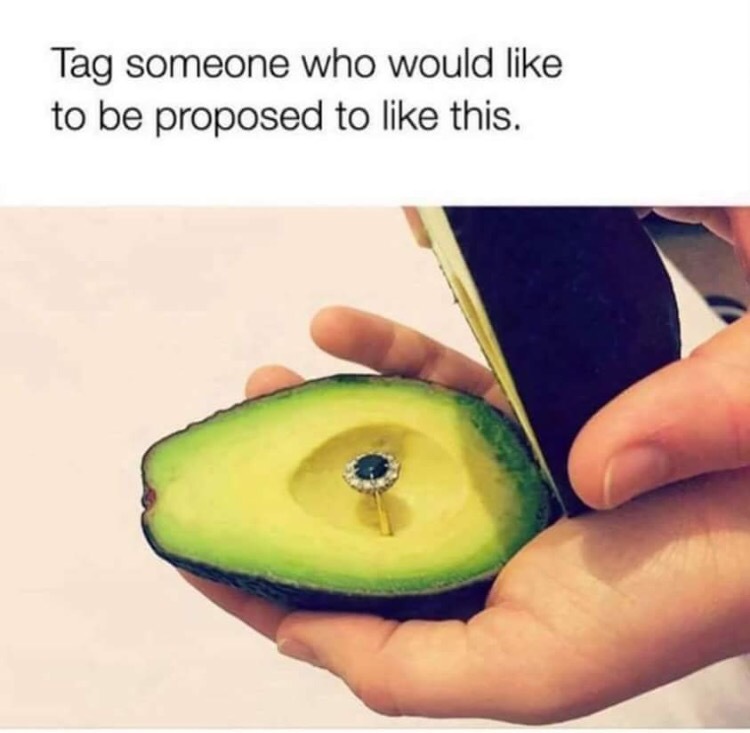 Alright, I just finished eating dinner and was scrolling on Facebook when I saw this meme! And it’s very fitting because tonight’s dinner is definitely for all the avocado lovers out there. We went furniture shopping and didn’t get home until pretty late, but luckily this dinner came together so quickly. We had chicken marinating all day in some store bought mojo mix. But the start of this show was this delicious Cowboy Caviar! Mix all the ingredients together and add more oil/vinegar/ seasoning to taste. Serve with chips, on top of chicken, or as a salad! So yummy! …AND MAKE THIS PIZZA FOR DINNER TONIGHT! Holy cow have you ever made pizza on the grill? It takes your typical pizza to the next level of goodness. Now you might be wondering why a dietitian is telling you to eat pizza, so let’s answer that question first. I’ve been trying to incorporate more meatless meals into my diet, and with this pizza I was able to load the crust up with veggies and herbs (tomatoes, onion, mushrooms, spinach, and basil) and not miss the meat at all. 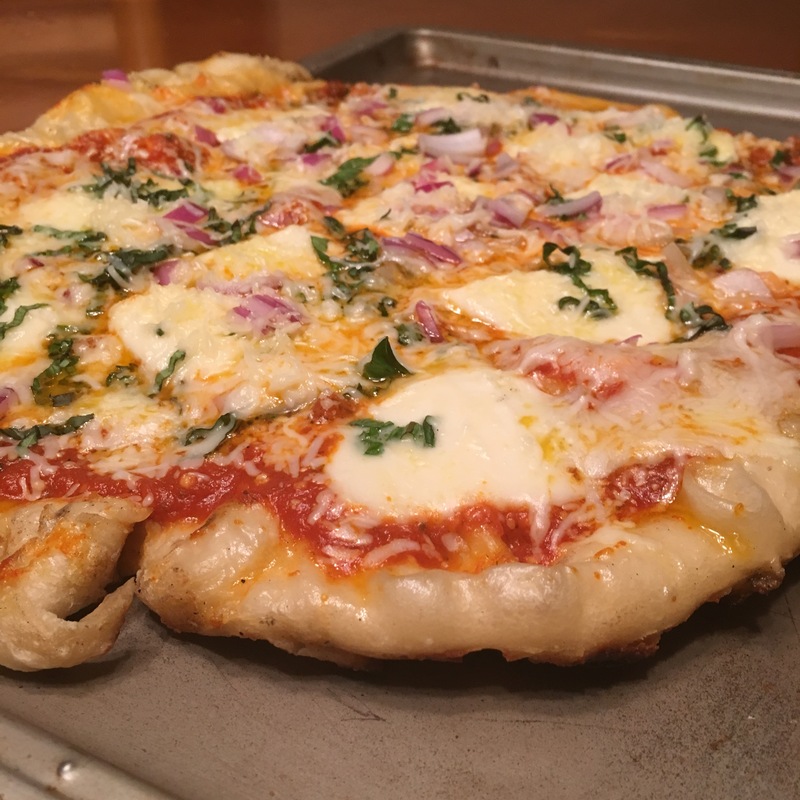 I did not use whole wheat crust because it wasn’t available at my grocery store, but I have seen it at some, so if you’re planning on giving this a try, see what is available at your store. The concept of this pizza is so easy; the technique was a little hard to master. Heat your grill up, basically as high as it can go. Ours was hovering around 400•F. Roll out your crust onto a plate or cookie sheet. Don’t go crazy about the shape, it’s not worth your time. Ours was about 1/4 inch thick. The part that you’re looking at is the top of the crust. You need to bake the top, before flipping it over and adding ingredients. Lightly brush oil and flour onto the top of the crust. I pinched the edges of my dough towards me to make a nice crust. Get ready to move fast: Invert the dough onto the grill. You need to cook it on this side for 4-5 minutes. While the top is cooking, brush oil and flour onto the bottom of the dough so it’s ready to flip. Once the crust is starting to char, use two spatulas (and maybe 2 sets of hands) to flip the dough onto its other side. Quickly, start adding sauce, pesto, veggies, and cheese to your dough. Let the dough cook another 5-6 minutes, or until charred. If your cheese or sauce needs to heat more, turn the grill off and let the pizza sit there for a few more minutes. Finally, using those 2 spatulas again, slide the pizza back off the grill, onto the plate, and enjoy immediately! The first time we made this, it was a little challenging to move so fast. But once we repeated the recipe the next week, we realized how simple it was. 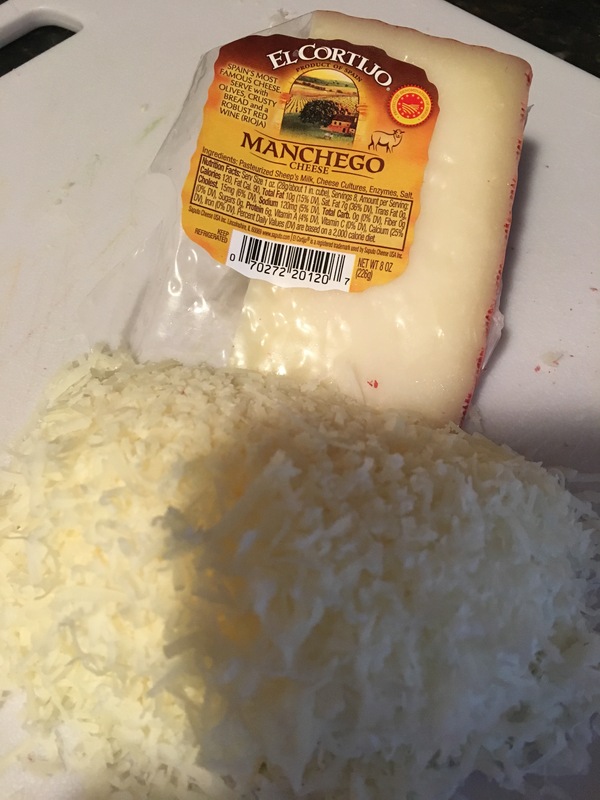 I love recipes that you can personalize to make your own– use whatever veggies and cheese you like. 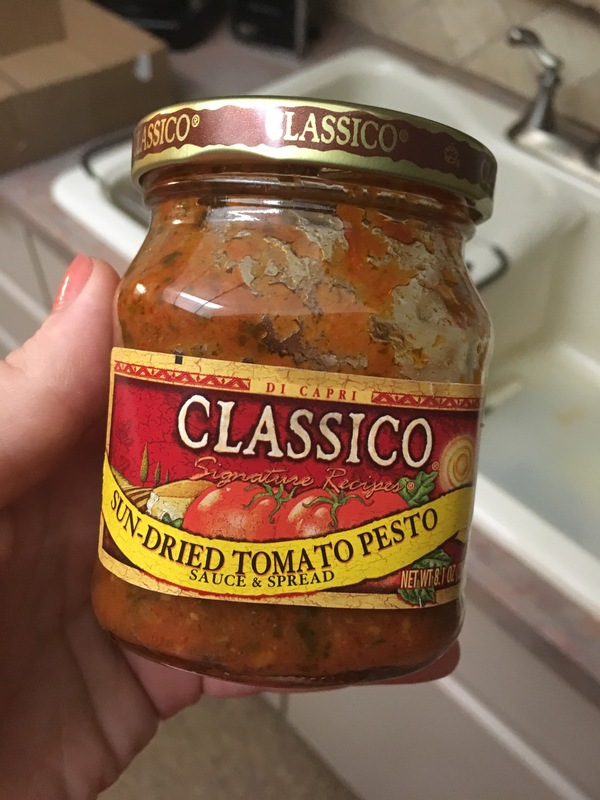 This is the pesto we used on our pizza, and we’ve been adding it to everything now! It gives it so much flavor!! Add a comment if you give this recipe a try and let me know what goodies ended up on your pizza! Enjoy! After watching What The Health? (see my last blog post) I was on a mission to create a meatless dinner that even my boyfriend would want to eat. 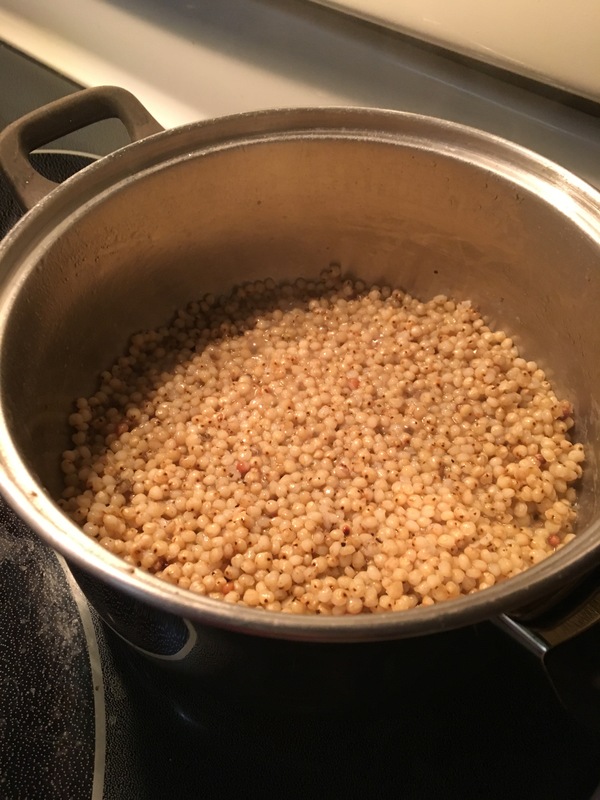 If you’ve been following my blog, you probably also saw my post about Sorghum. We still had half a bag of sorghum in the pantry so hence my vegetarian meal had direction. Using the slow cooker, I found, and modified, a recipe for vegetarian chili, with sorghum, black beans, corn, peppers, onion, zucchini, and tomatoes. 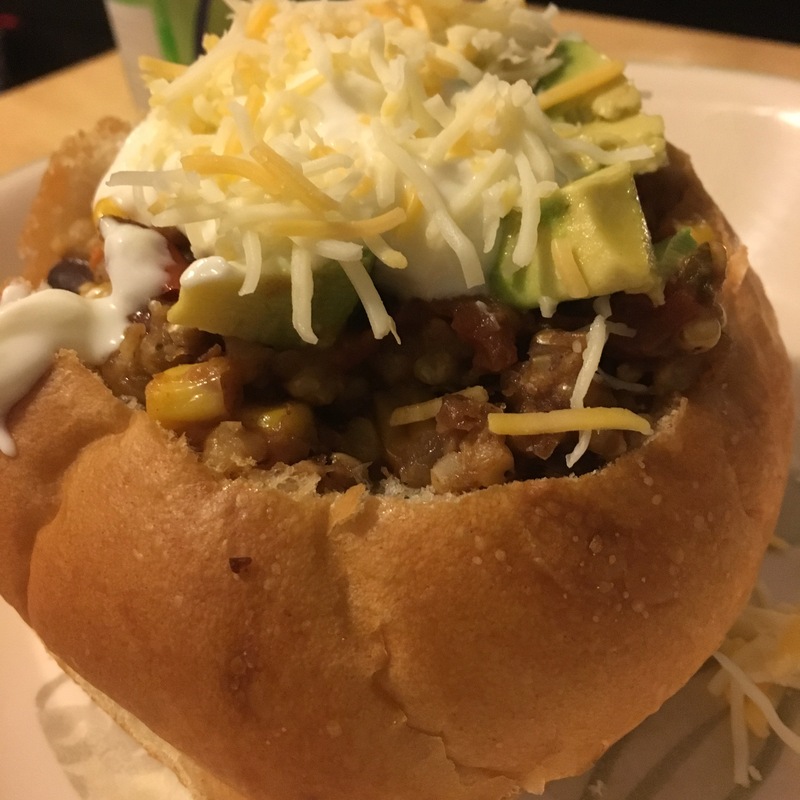 We served it in a bread bowl and toppped with cheese, avocado, and sour cream. It was a HUGE hit and we had a ton of left overs. Check out the recipe below! Heat olive oil in a skillet and brown onion, garlic, chili powder, zucchini, red pepper, jalepeno pepper and thyme on the stove. Sautee for 5-10 minutes, until vegetables start to become soft. 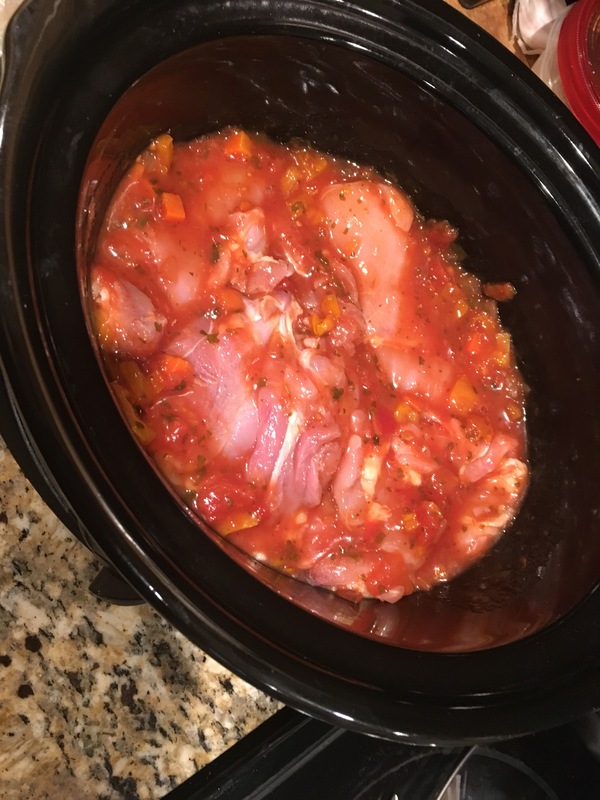 Add cooked veggies, tomatoes, beans, corn, and sorghum to the crock pot. Stir in 2 cups of liquid. Cook on low for 8 hours. Serve in a bread bowl if desired. Top with sour cream, cheese, avocado, lime, cilantro, or whatever toppings are desired. Sorghum is a grain that originated more than 5,000 years ago in parts of Africa and Australia. Today you might have also heard of sorghum flour, which is a gluten free alternative to regular flour. Last night, I gave sorghum grain a try for the first time. I was excited to try it because sorghum is very high in protein (5 grams) and fiber (5 grams) per serving. It’s a good source of antioxidants, and it’s slowly digested which can help balance your blood sugar. 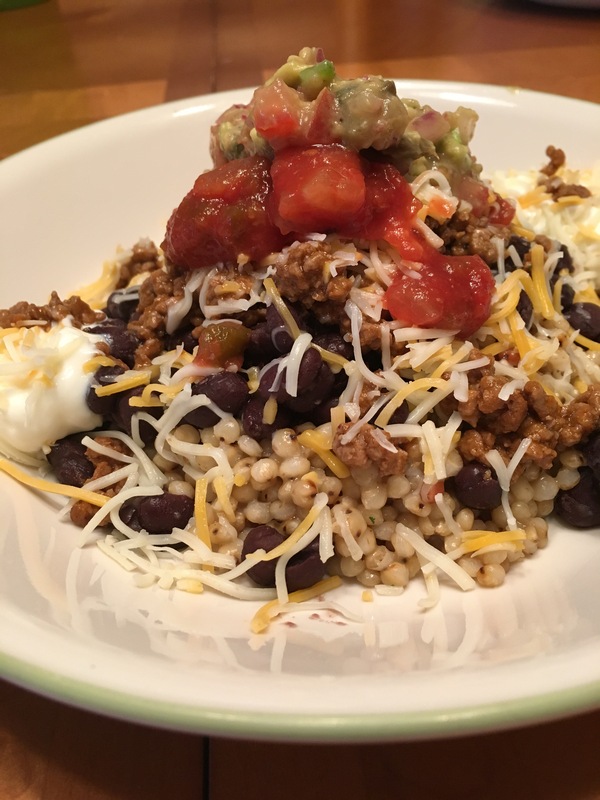 It’s super versatile, but we created mock Chipotle Bowls with ours. Topped with left over taco meat, black beans, guacamole, cheese, and sour cream it was so delicious. I also can’t begin to tell you how filling it was, even my boy friend was surprised by how satiated he stayed with this meal! 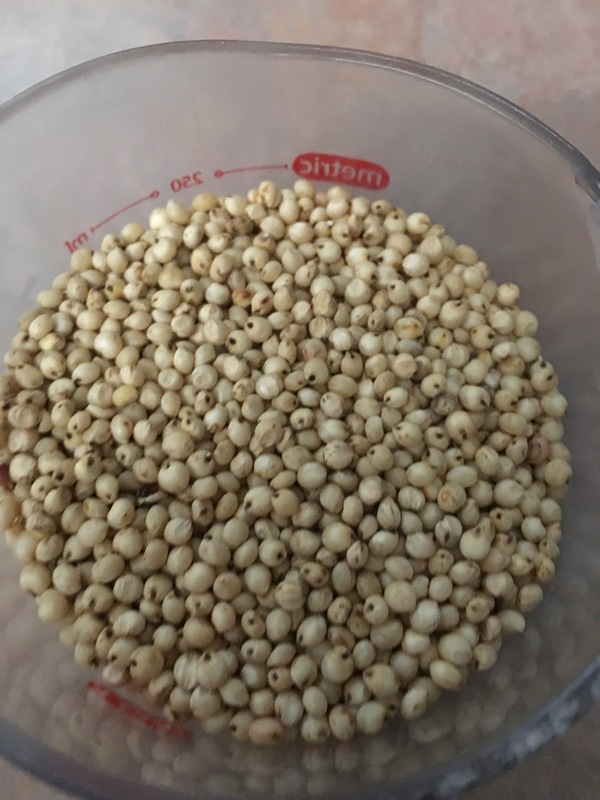 If you ever give sorghum a try, or if you’re already a fan, please send me your recipes so I can explore some more with this wonderful grain!